We currently provide high-density polyurethane concrete leveling for commercial projects in the following states: Arkansas, Colorado, Florida, Georgia, Illinois, Iowa, Kansas, Kentucky, Louisiana, Minnesota, Mississippi, Missouri, Nebraska, Oklahoma, Tennessee, Texas, and South Carolina. 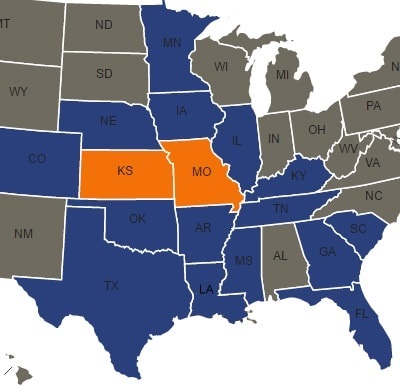 Our residential services include the states of Kansas and Missouri, only. For more information, contact us for a free online quote. If you need residential work done and you are in our commercial service area - go to NCFI.com and contact them to get in touch with a local installer in your area. Tell them Polyjacking.com sent you!